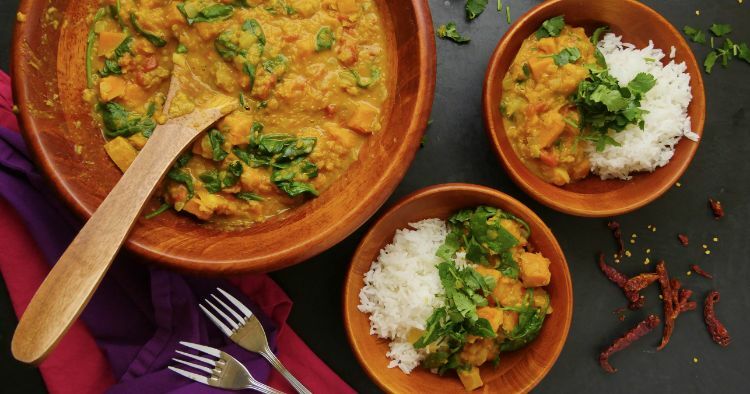 This filling curry is a fantastic and super nutritious one-pot meal. In addition to protein- and fiber-packed red lentils, it includes sweet, tender butternut squash, which is loaded with nutrients. It’s made in the Instant Pot, which means you won’t have to toil over it for hours, but you’ll get a piping hot, deeply satisfying dinner. A whole butternut squash can be intimidating to peel and dice, but you can make it a whole lot easier by microwaving the whole squash for 5 minutes or so. This softens up the peel enough that it becomes much easier to cut into. You can also buy pre-peeled and cubed butternut squash in most supermarkets. Heat the oil in the Instant Pot using the sauté function. Add the onion, garlic, ginger and jalapeño to the pot and cook, stirring frequently, for 3 minutes. Add the turmeric, garam masala and cayenne and cook, stirring, for 30 seconds more. Add the tomatoes and cook, stirring for 2 more minutes. 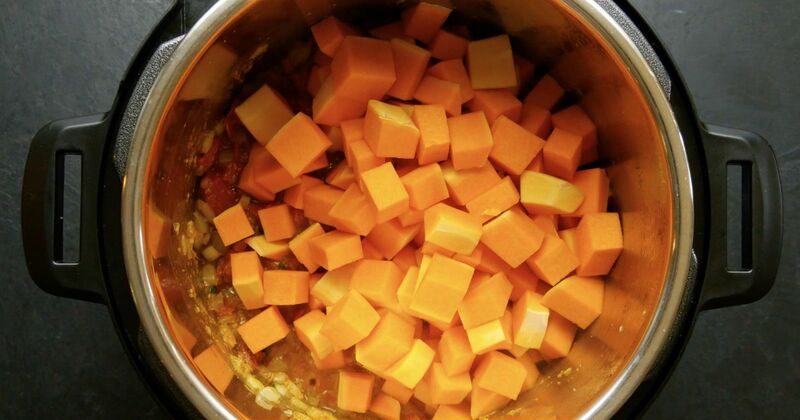 Stir in the squash, coconut milk, lentils, water and salt and stir to mix well. Close the lid of the Instant Pot and turn the valve to the sealing position. Cook on high pressure for 4 minutes. When the cooking time is up, quick release the pressure. Remove the lid from the pot and stir in the spinach. Taste and adjust seasoning as needed. Just before serving, stir in the lime juice. Serve hot, garnished with cilantro leaves.